Ireland finished seventh in Friday's fourth round of the FEI Super League Nations Cup series at St Gallen in Switzerland. 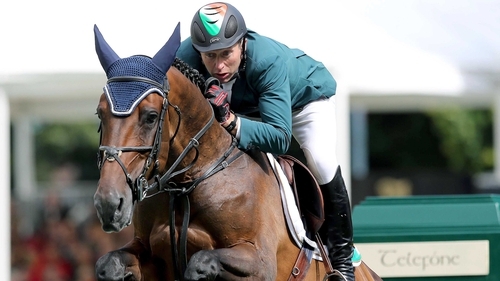 St Gallen was not one of Ireland’s six selected points-scoring rounds of the series and Rodrigo Pessoa’s Irish team still have four more opportunities to gain points in their bid to qualify for the world final in Barcelona. Ireland were fifth at the halfway stage on 12 faults, after all four riders finished with one fence down apiece. Dermott Lennon and The Irish Sport Horse Loughview Lou-Lou (ISH), owned by Judith Sossick, lowered two fences when first to go for Ireland second time out. Richard Howley with Chinook, owned by Mr & Mrs Aitkenhead then repeated their single error from the first round, before Anthony Condon with Kat Taylor’s Balzac finished with eight faults. Mark McAuley was last to go with the Jocelyn Berthelot-owned Utchan De Belheme and finished with the same four fault score as first round.This left Ireland on a team total of 28 faults in seventh, just behind France in sixth on 25. The French had been leading on a zero score after the first round but faded badly after the brake. For the second round in-a-row Italy took the winners prize after they finished on nine faults. The home team from Switzerland took runner-up spot on 12, with Germany third on 13 ahead of Belgium in fourth and Sweden in fifth. Pessoa’s native Brazil finished in eighth place. Afterwards, he remained upbeat and is looking forward to Ireland’s remaining four Nations Cup fixtures. "Today was a tough day at the office and this happens in sport. We were a bit unlucky in the first round – we had some good rounds but just couldn’t get that clear. We tried to fight in the second round but unfortunately we couldn’t improve our position. "We will take the positives from this, learn from our mistakes and move on. It is good that this was not one of our points-scoring rounds, we still tried to get a good result but that’s sport. We have four very important rounds to look forward to now and we will be taking each one very seriously." Ireland’s next points-scoring round of the FEI Division 1 Nations Cup series will be at Rotterdam on 23 June, followed by Falsterbo (14 July), Hickstead (28 July), and Ireland’s home Nations Cup at the RDS in Dublin on 11 August, where teams will compete for the Aga Khan trophy.